Following over 12 months of testing, we are pleased to announce the release of our uprated Supercharger Pulley and Stage1+ performance software for the Audi 3.0T FSI engine. The pulley is CNC machined from high grade stainless steel, and designed with a smaller radius than the factory pulley fitted to the Eaton TVS Supercharger. When combined with our Stage1+ calibration this allows us to further optimise your vehicle making use of the increase in supercharger rpm and improving on the performance you’re used to with our Stage1 performance software. As you can see from our test data there is a huge improvement in both power and torque throughout the rev-range, showing more than 100hp and up to 90lbft at the wheels over stock. On the road this translates to a more flexible engine with more midrange and a lot more ‘punch’ lower down than both a stock or Stage1 vehicle. Performance testing of our own S5 Coupe show consistent improvements over stock and stage 1, with repeatable 3.7 second 0-60mph and 8.8 second 0 – 100mph times. Regardless of times, facts or figures a Stage1+ 3.0TFSI makes for a very fast and enjoyable car to drive. 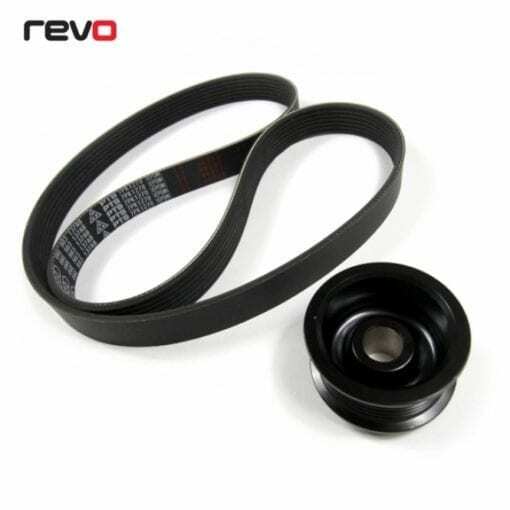 NOTE: Stage1+ software and Supercharger Pulley Upgrade is not compatible with 3.0TFSI vehicles using a 6speed Tiptronic transmission (As found in some early none ‘S’ model vehicles, speak to your Revo dealer if you are unsure of the transmission in your vehicle).